A wedding day is one of the most special days of any person’s life and at MaxNRG Personal Training we are committed to ensuring you look and feel fabulous on this very special occasion. You may have four weeks or four months to get ready for your big day, your MaxNRG personal trainer is with you from start to finish. Whether your goal is to improve your overall fitness and well-being, be more energised or to lose those few extra kilos to feel more comfortable and confident on your special day, your trainers will guide you through a comprehensive health and fitness program that will achieve the results you want. Although we can’t do all the hard work for you, we will provide constant motivation and support during your quest to look and feel your best! Commit to looking and feeling fantastic on your special day! Planning a wedding often takes over every aspect of your daily life. You want everything to be just right: the invitations, the flowers, the hair, the dress…so why not feel great about your body too. 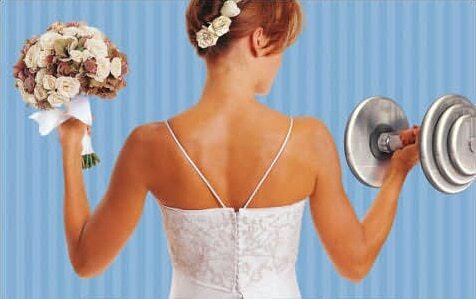 At MaxNRG Personal Training we completely understand the enormous time and energy commitments associated with wedding preparations, which is why our mobile personal training service is perfect for you! Let us plan the workout and deliver it to your doorstep with all the equipment needed to ensure you receive a challenging and effective training session. Part of our commitment to you is making sure you have adequate time to achieve your personal goals. Your trainer will design a program specific to your busy lifestyle and most importantly the program will be directed by your wedding time frame. Starting as soon as you can will give you the best chance of reaching your desired goals. Looking fit and fabulous requires a routine of regular exercise and a good, balanced diet. A mixture of cardiovascular and strength training, along with the support of loved ones around you, will help you look your best for your wedding day! Our wedding packages can be tailored to meet your budget and schedule. We recommend that if you are serious about your results you should be doing at least 30 minutes of cardiovascular exercise three to four times a week and another 20 – 30 minutes of strength training two to three times a week. Group Training or Personal Training is a great way of getting you started and keeping your fitness regime on track. Either team up with your partner-to-be or gather together your bridal party and have them exercise with you with our private group training sessions. Wedding spending has almost doubled over the past decade, with couples now outlaying a record $54,294 on the average Australian wedding, Bride To Be magazine’s bi-annual Cost of Love study has found, with much of the spending aimed at ensuring the bride looks fantastic on the day. In comparison with all the money spent on photographers, dresses, flowers, hair and makeup, fake tan and hold-me-in underwear, our Wedding Fitness programs can tailored to fit any budget and we guarantee to get you looking and feeling your absolute best on your big day. To learn more about how we can help you prepare for your wedding day, simply fill out our easy online contact form or call us on 0403-741-278 and a member of our personal training team will discuss how we can provide the best possible support and training plan for you to succeed.